PayScale has “reinvented” its flagship Insight product as “Insight Lab,” a system designed to provide data-driven compensation analysis to HR practitioners and hiring managers so they can make more informed decisions about pay. At the same time, the company announced related technologies that streamline compensation management, improve collaboration between HR and managers, and automate a number of routine compensation tasks through machine learning. “CEOs and other executives are facing incredible scrutiny to get compensation right,” said David Smith, PayScale’s chief product and strategy officer, in a press release. In addition to issues such as pay equity and a tight labor market, employers must interpret compensation data from multiple sources while HR spends its time entering worker pay details communicating with managers. Insight Lab, Smith said, was designed to streamline the process so HR can determine accurate pay rates. In addition, PayScale contends the product will allow HR to “feel much more confident” about compensation decisions. That’s not a bad note to sound since compliance remains a concern at so many companies. Job Collaboration, which enables “more informed conversations around pay” between HR and business managers when pricing positions across the company. It allows managers to provide feedback on core elements that impact pay, improving job definitions and more pay competitiveness. Company Sourced Data. 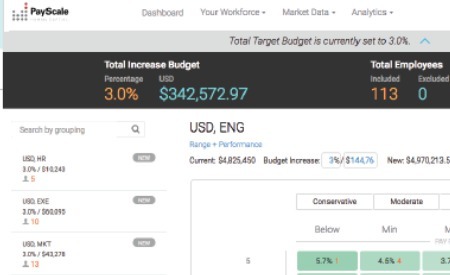 PayScale now automatically creates an employer-sourced data set to complement its current employee-sourced salary offering. Updated quarterly, the employer data set automates survey participation and job matching. In addition, PayScale will support a customer’s preferred compensation data set and simplify the process of integrating multiple data sets. PayScale Helix: PayScale’s proprietary data engine applies data science to the increasingly large sets of data used for benchmarking compensation, interpreting job skills and requirements, and predicting pay for positions across geographies and other segments. The technology–which blends data modeling, machine learning and “innovative” matching and prediction algorithms–allows Insight Lab to generate more detailed reports on more jobs, surface more precise matches and “ingest more data than any other compensation solution in the industry,” the company said. Helix can now also learn company preferences over time. PayScale’s announcement may be welcomed by the many employers who are struggling to attract talent. According to Glassdoor, 65 percent of hiring managers say they have trouble competing with the compensation and benefits packages at other companies. Forty eight percent said salary and compensation were among the top factors candidates consider when deciding on whether or not to accept a job offer.